If you have sustained damage to your hair, scalp or face as a result of the negligent actions or lack of skill of your hairdresser Cohen Cramer can help. We are experts at dealing with hair damage compensation claims and can help you claim the compensation you deserve. A trip to the hairdressing salon should improve how you look and feel about yourself. However, due to inappropriate use of equipment or lack of knowledge, you could end up with a painful and disfiguring injury that can lead you not only in pain but also mentally distraught. We understand this and, working closely with expert trichologists and other appropriate medical experts, can help you claim the compensation you deserve. A hairdressing accident can seriously damage your hair and leave you shocked, distressed and in pain. A lack of skill and attention to the task in hand can lead to a wide range of injuries. We have dealt with burns to the scalp caused by a lack of patch testing to the partial removal of the earlobe with scissors caused by a lack of attention when cutting hair. We can deal with your claim on a ‘no win- no fee’ basis so that if for any reason your claim is not successful you don’t pay us a penny for the work we have done on your behalf. We will look to recover compensation not only for the distress and upset caused by the damage to your hair as well as any physical injuries you may suffer. In addition, we will claim for the cost of the original treatment and any further procedures/treatment you may need as well as all and any other financial losses that may arise as a result of the incident. The main cause of accidents and problems resulting from treatment at hairdressing salons is lack of knowledge and incorrect/inappropriate use of chemicals and other hair products. Reduction in hair quality leading to lack of shine, body etc. Proving liability and placing a value on your claim is not always a straight forward matter and you need expert help and advice. We will use our skill and knowledge to show that the hairdresser was at fault and to make sure that you receive every penny you are due. 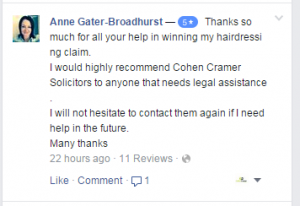 Here at Cohen Cramer, we are experts at dealing with hairdressing claims and we can help you claim the compensation that you deserve. How can my hair be damaged? Your hair can be damaged in a number of ways by inadequate, negligent or poor service by your hairdresser. Here are some of the more common causes of injury and damage to hair from perming. to ensure compatibility and suitability with both your hair and scalp. If these tests are not carried out it does greatly increase the chances of damage to your hair or scalp. If excessive amounts of perming reagent are used, or the reagent is too strong, it could lead to scalp burns and/or primary irritant contact dermatitis. This can lead to the skin becoming sensitized so that further chemical treatments cannot be used. It is a common mistake for hairdressers not to bother with all the required tests, or to assume that if there was no problem in the past using the product on you will be o.k. This is not appropriate as your body; scalp and hair are always changing and can react differently every time a chemical is applied, so it is crucial that the above-listed tests are done every time you attend at your salon. Incorrectly applied hair extensions can cause stress and strain upon the existing natural hair and, in turn, can lead to pain and discomfort and hair breaking away from the scalp. Problems with hair extensions normally result from lack of knowledge and expertise when attaching the extensions to the original hair. The use of chemicals to straighten hair can lead to the same problems as the perming solution applied without the required tests. Skin Tests and Strand Tests must always be carried out prior to any chemical straightening procedure. Damage from heated styling aids is also extremely common. Severe progressive damage to the hair and scalp can occur if these chemical reagents are incorrectly applied. Strand tests must be carried out before each and every chemical application to ensure the desired colour result can be achieved. Patch tests also assess your compatibility with any chemicals, which have been previously applied to the hair. Severe breakage and damage to the hair can result if misapplied. Skin testing indicates if the scalp can withstand the intended reagent without any adverse allergic reaction or burns. Contact Dermatitis, scalp burns and in extreme cases, even anaphylactic shock can result from misuse of these chemicals. We work closely with one of the countries leading trichologists to make sure that you have the expertise to prove your claim.